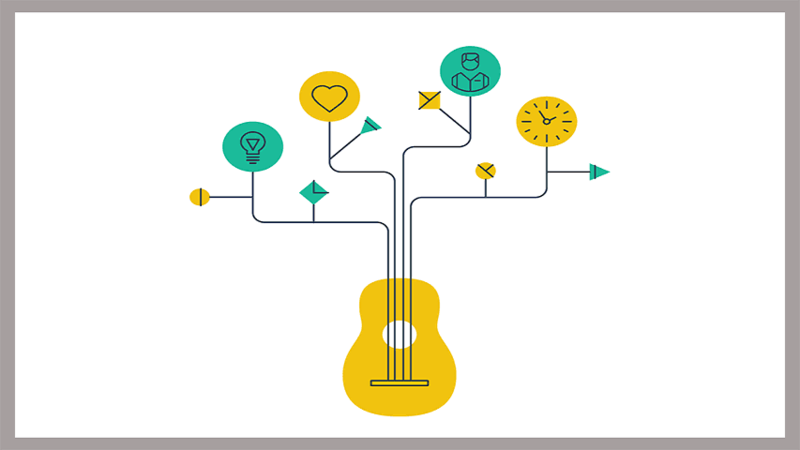 Learning to play guitar is really pretty simple… but that doesn’t mean it’s easy. I get that it takes patience and persistence. I’m just saying that it’s not complicated. It comes down to two basic things: knowing what to practice and making the time to do it. Today, I’ll deal with the issue of practicing, not what to practice (we will deal with that in other lessons). I want to talk about the mechanics of making time to practice and getting the most out of it. You know, we really can do incredible things. One of the advantages we have that animals don’t is that we can consciously choose the habits that we develop. That doesn’t mean we always exercise that choice though. Developing habits place a large role in learning to play musical instrument. One of the most important habits you can develop is the habit of practicing. Yes, I said habit. Practicing, itself develops playing habits but it also develops the habit of practicing. At first, making time to practice is a conscious process. You have to make yourself do it. Of course, there’s conflict because you have other things you want to do. If you practice regularly though it gets easier and easier because you’ve developed the habit of practicing. It takes a little while, and what that actually means is that your mind and your body become predisposed to just sitting down and practicing. Think about when you get up in the morning and you go to brush your teeth. You don’t have to think too hard about getting yourself to the bathroom and working the toothpaste to get it on the brush. It is something you just do. Because it’s a habit, you wouldn’t even think twice about going to the bathroom and brushing your teeth. It fact you would feel weird if you didn’t do it. Well that’s what happens when you develop the habit of practicing. At first, it’s an effort but over time it actually gets weird if you don’t practice. 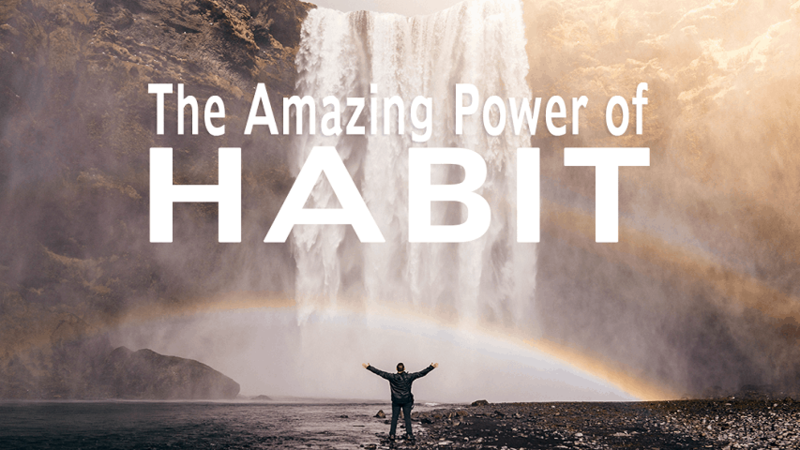 There are some things that you can do to help develop this habit sooner rather than later. The most important thing is to make time in your schedule and hold that sacred for at least 30 days. If you practice regularly for 30 days, you will start to develop that habit and it will get easier and easier. Research has shown that consistent action over a period of about 30 days tends to develop a habit*. 1- It’s easier for your mind to get locked into that habit of practicing when you are in a familiar surrounding each time. 2- It also becomes easier to practice if you have all your stuff (like your guitar and your tools) there and ready to go. It just takes less effort to get started. So go ahead and set up a practice space that’s comfortable for you and that you look forward to going to. For guitar, the space doesn’t have to be big. I‘d recommend having a comfortable chair, and a stand by the chair with your guitar on it. On the other side, maybe a small table with the electronic tuner handy. It also helps to have a music stand ready to go. Why not go ahead and decorate a little bit? Maybe put some photos that inspire you of the guitar players you admire… or whatever else that might motivate you. The main point is to make it easy for your subconscious mind to want to go to that place. Everyone is busy these days. I can 100% relate to having difficulty making time to practice. But let’s face it. Not practicing is NOT AN OPTION to playing guitar. I often have some version of this discussion with myself… “Is this important to me? Yes it is. Then how can I make it work?” For most people what this really means is that they haven’t developed the practice habit. Here’s some things that can help. Again, this will help in creating that habit more strongly and more quickly. It also helps if you’re negotiating with other people in your household for either space or coordinating different activities. This is by no means mandatory, and of course it is much better to practice anytime rather than not practice at all. It’s important in the early stages of learning that you try not to let more than 24 hours go by without practicing. This will help you develop the habit of practicing... but it also reduces what I call “backtracking”. It goes like this. After a couple of days you go back to practice and at first you can’t quite remember what you’re supposed to be working on. Then when you do get clear on that, your fingers just don’t seem to move as easily as you remember. Then this whole relearning thing kind of gets you back to where you were… but it’s just kind of demotivating. It really is different if you’ve been playing for 6 months, or a year, or even longer. By then the physical habit has been engrained. You’ll find that you’ll start retaining new information much more easily. I recommend in the early stages of practicing about 30 minutes a day, 6 days per week, leaving one day as a break. This seems to be a good balance. If you try to commit to practice for too long you’re likely to get discouraged when you can’t make time to do it. Best to start with 25-30 minutes and then extend that over time. On the other hand if your practice sessions are too short you’ll find you’ve just got warmed up and it’ time to stop. Also you may not make enough progress to keep up your motivation. Staying Motivated ... What’s Next? Most people do not stay motivated for long if they don’t see some kind of progress. Of course, more practice never hurts. I’d encourage you to make a plan to practice 30 minutes a day on some specific material that’s designed to build on previous lessons. It will help you feel like you’re making progress. After that, hang out and play for fun for as long as you’d like! Practicing this way will keep you moving forward. It will keep the fun and excitement in your playing. Tracking your progress can help you stay motivated as well. I’ve included a practice diary sheet that you can download and copy. 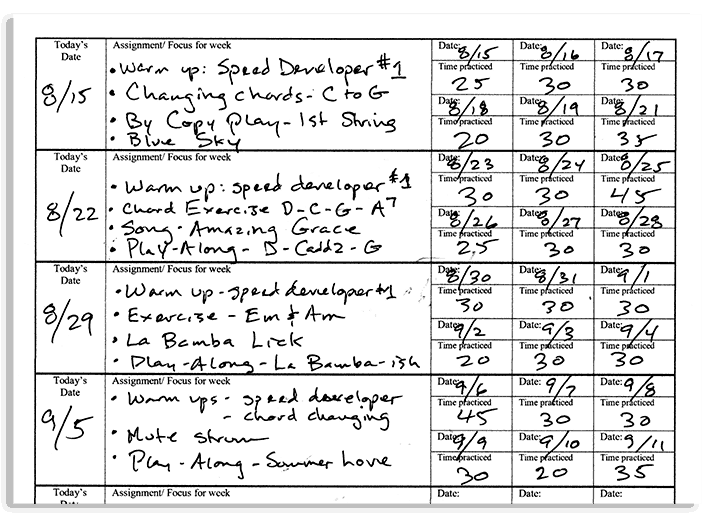 Use the sheet to record the amount of time that you practiced on each day, a brief description of what you’re practicing, and what progress you’ve made. Keep this handy and look at it often. Sometimes it’s just enough motivation to help you get to practicing. I like to also keep track of my speed of certain exercises that I’m working on with the metronome. I find this kind of exciting and I like to see my progress. I also like to make time to create something new. I like to experiment with chord progressions or a melody. That’s the process that led me to creating my own music and my own CD’s. If you live with other people like most of us do, it really helps to get the support of your family or roommates. This could be as simple as explaining to your significant other or friends what you’re trying to do and asking for them to encourage you to practice. You might even want ask for help in setting up a space and maybe encouragement in keeping that practice time without distractions. This is usually a process and not just a one-time discussion, but the effort can be worth it many times over if you have their support and cooperation working for you. To create a simple practice plan, try using the material from whatever lessons you’re working through to get started. I’ve included some ideas on how you can organize your practice schedule in this lesson. As time goes on and you progress with your lessons you’ll begin collecting things that you know you need to work on more. You’ll also find that I give tips and techniques for organizing your practice time throughout my courses and blog posts. There is no one way to do this. The trick is to just get started and make adjustments as you go. In this case, a weak plan is better than no plan at all. A. Make a schedule for the next three weeks of when you’re going to practice. B. Get the cooperation in some form or fashion from others in your household. C. Create a space to practice. D. Create a simple practice plan. E. Go to that space and practice for one 30 minute session. * Actual studies show a range of from 21 to many more days depending on the difficulty and complexity of the habit. In general the average was 66 days. I’ve found that 30 days seems to work for many habits like the habit of practicing guitar if the student is motivated. I’ve updated this from 21 days after creating the audio version of this article. I practice everyday, sometimes for 30 min sometimes for hours, more hours than min. My problem is I don’t think I am practicing the right things, I don’t know what the right things are. I can play countless songs, but am not getting any better, just kind of staying in the same level. I think I should be a lot better than I am at this point in my learning. All the courses and lessons offered online etc.. all say something different, so I am confused and stuck at one level.. HELP!! You’re right that about half an hour a day in the beginning is necessary to get the basic skills needed. After that I find that several short sessions, even 5 minutes can help progress. I take the guitar out in the morning and leave it on my bed so that every time I walk into the room, I pick it up and practice a bit. I’ve found that in a short while I’ve succeeded in acquiring the new skill and without boredom. Tomas – Once again you have clearly provided excellent advice! I know that using the chart that you provided along with your plan for specifically structuring of my practice time will make a big difference in my playing.